The Best Thing has happened!! There is a New Invention that has come to our house. It is called A Dog Door. It is just for Dogs Like Me to go In and Out of the House. A Man came two weeks ago. 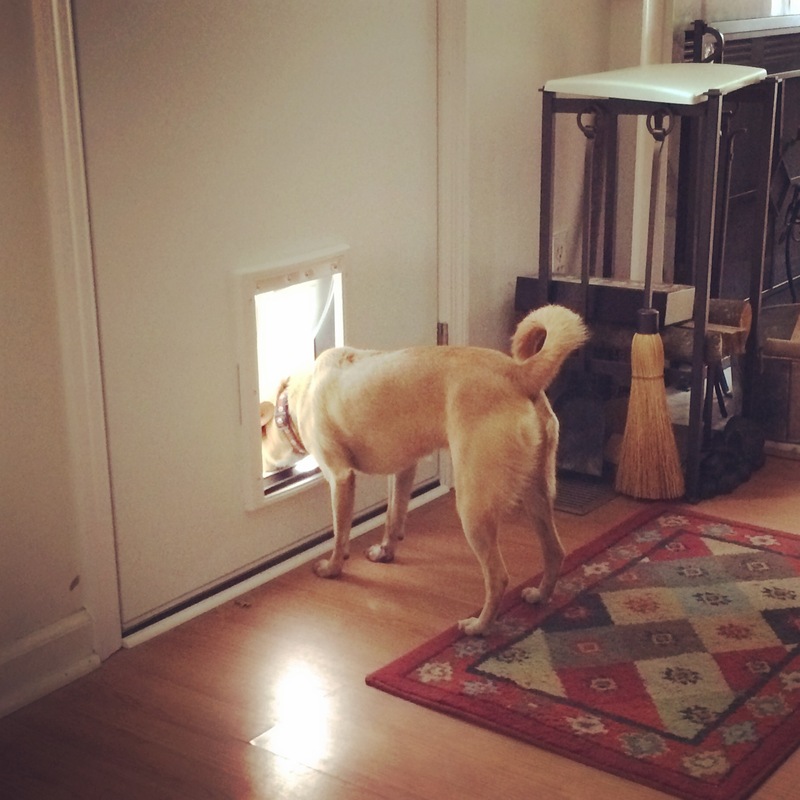 When he left, then we had The New Dog Door. It was The Best Day of My Life. I went In and Out and In and Out and Out and In. When I don’t feel like going all the way out, I can peek out the door. I like to Run Outside and Scare the Squirrels off My Deck. Mom says it makes me very tired by bed time. Mom closes the door at night. But that’s ok because I am Asleep then, anyway. I love My Dog Door. Charlie loves sitting in the dog door watching all that goes on . A GREAT invention–don’t know what we would do without ours. Yay for going in and out whenever you like. What a great idea, Arya! Your have a really thoughtful Mom to think of doing that. How about Jack, does he make use of it also? How cool! Freedom to do your thing when you want is wonderful. So happy for you, Arya. Really puts you more in control of the back porch and the back yard, along with Jack, of course. Out. In. Out. In. Out. In. Eat. Out. In. Sleep. Peace and joy for all – except the squirrely girls. What does Arya mean? Acronym possibly. That is what I found in research — hoping — since it seems to fit her behavior of which we enjoy reading!